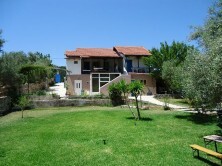 House of Garden is a villa located in the village of Dragano, in the southwestern side of the island of Lefkada, a destination well known worldwide for its beautiful beaches (Porto Katsiki, Egremni, Kathisma, Gialos). It consists of two apartments, one studio and two double rooms, all of them offering all modern comforts. House of Garden offers two apartments of one and two bedrooms, one studio and two double rooms. All of them have access to a balcony. Each accommodation is offering free internet access via Wi-Fi, a bathroom with shower, TV, air conditioning, refrigerator, coffeemaker, hairdryer, clean towels and linen. The two apartments and the studio, are also offering a small fully equipped kitchen. Available to all our costumers is a washing machine and a steam iron with ironing board. We also offer free parking. We would like you to stay for 11 nights from 09/28/2015 to 09/10/2015. We are two adults and one dog.